The past few months have been AMAZING!!!!!! Full of a lot of heartache and many tears as we have been saying goodbye to our Pennsylvania home & beloved friends and family there…and full of joy I couldn’t have imagined saying hello to our precious Emily and Anna as they returned from their missions! Saying hello to new LOVE! -our oldest, Isaac, asked his beautiful “Amore” to marry him; and our daughter Anna said YES to a faithful young man named Hyrum who shares her heart; our Emily recently met and quickly connected with a wonderful young man we all approve of; and even our Mikela decided to get in on the dating action and is enjoying dating a great young man named Mike! We have said hello to a new place we can’t help but love already and said a big, happy hello to old and new friends here and to the joy of being close to lots of family in Utah. My husband is even saying hello to a new hospital and to new patients as he begins practicing in this new location! Like I said, it’s been amazing! 1st, picking up Emily and Anna! JOY of our lives!!! Anna finished her mission one day before Emily and with permission of their mission presidents flew into Emily’s mission! Emily would pick her up from the airport. 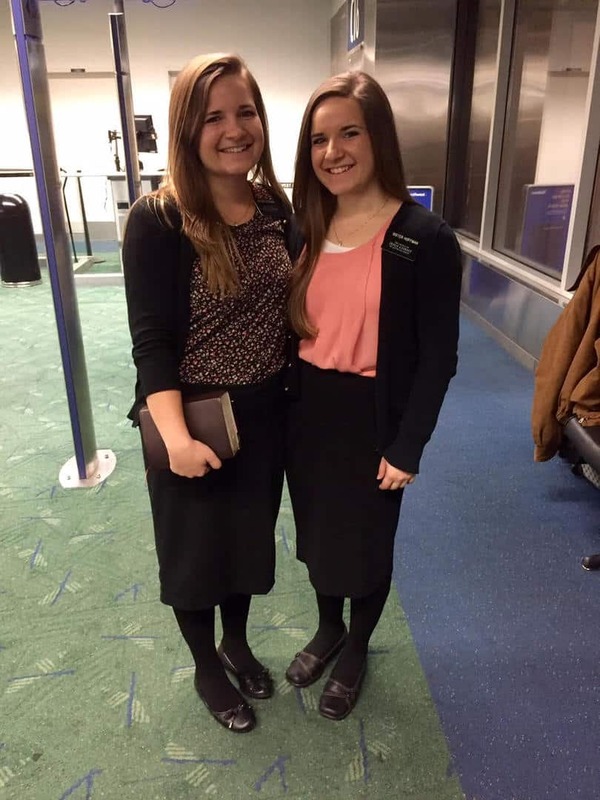 This is Sister Hoffman and Sister Hoffman embraced again after 1 1/2 years of being apart (first time separated in life really). Then Mike and I picked them up the next morning! Best feeling in the world for them & for us to know they had served the Lord with ALL their hearts, might, mind, and strength!!!! And then we visited! Emily took us to see some of those she had had the opportunity to teach during her time in her mission in San Fernando, CA. And then we flew to Portland, OR and visited some of those Anna had the opportunity to teach! I wish I had ALL the pictures! They are all stored in my heart. We asked each of those we visited to share their story, their experience with us. To witness each person’s gratitude, love, complete turnabout in their lives, the better place they had found, the peace, and joy, and love in their hearts!- it was completely moving. I noticed one distinct characteristic that each shared as they told their stories of change and hope and redemption: humility- a complete willingness to do whatever God asked them to do through His missionaries. I returned home with a greater commitment and desire to BE HUMBLE and follow God’s word given through prophets and apostles, local church leaders, through scripture, and through the gift of the Holy Ghost. May I share 2 of these most touching visits with you? Emily took us to meet “The Boys”, friends and brothers ranging from age 6 to college age that had rallied together to be taught the gospel of Jesus Christ by the sister missionaries. As we walked up the apartment steps we could hear their excitement on the floor above us, the door opened for a second and we felt and heard the excitement, “they’re here! They’re here!” And then it closed again as we finished walking the steps. We could hear their anticipating whispering and giggling inside the door when it opened a wave of love spilled out! “Sister Hoffman! !” Then quieter, “Other Sister Hoffman too!” Then even quieter spoken to his brother, “whoa, she looks just like her!” These young boys were SO POLITE shaking our hands and saying “hello”, “hello”, “how are you?” A couple of the younger boys ducked under our hands and disappeared down the steps. They appeared a few minutes later in the apartment with a couple more young boys, their friends from downstairs, and I could see this had been the pattern while the teaching had gone on. One young boy started listening and then sincerely prayed his brother could hear this “good news” too. His brother did join the next lesson and they prayed at the end more brothers would come. The next lesson they hoped their friends would come and collected them in to listen the next time. Even their brother gone to college eventually got to listen and learn from these 2 sister missionaries sharing the best news ever! I really cannot describe in words the feeling that was there in that crowded little CA apt, with their faithful, down-to-earth mother who only spoke Spanish (my husband was able to converse with her) and these “boys”, active, strong in spirit, soo excited and thrilled about Jesus Christ and His Church! They shared with us how they made good choices on a daily basis now, and didn’t swear and turned away from friends inviting them to do bad things. They shared their testimonies of Jesus and then they all wanted to pray so we let each have a turn. Kneeling on that small, banged-up hardwood floor listening to the sincerest prayers I have ever heard I cried in thanks that I got to witness this, that these boys got to have the strength and guidance of God more fully in their lives now…and I plead with Heaven to protect them as they grew! I hoped those innocent, joyful dreams of a good life that they had in their hearts that day could be fulfilled…even greater than they expected (as God so often does bless us that way). I know as they are faithful to God and strive to keep His commandments they will be blessed, even beyond their dreams! A really neat thing happened on the way out! We left and were literally FILLED with happiness and with smiles, even laughter because of the joy, talked about the visit as we came down the steps. Then as we came to the street we were passing a hooded man- the first impression he appeared quite down on life. We said friendly hellos and then my husband began to talk to him in Spanish. It was their father. A “tender mercy of the Lord” as Emily had always wished to interact with him more but never saw him and could not speak Spanish. His countenance was lighter and happier as we left. How we pray for that family and their friends! For ALL we met there in CA those couple of days!!! (Wish I could share all with you, but here are some pics). We had many memorable visits and we saw so many miracles in our time with Emily and Anna! I wish I could write them all but there is one more story I’d like to share of a visit we made in Oregon to a group of men that Anna and her companion had taught. We arrived at a nice building, like a group home I guess. There was a big open room for visiting and as we walked in several men sat at a table in the nearby corner. A huge Christmas tree was lit and beautiful in the front and center of the room. The men stood up as we entered and called out in happy greeting to our Sister Hoffman and us. We each shook hands and shared names. They seemed very glad to see us. We had brought pizza to share and placed it on the table and they grabbed more chairs for us to sit down. As we did so we asked, as we had with others on other visits, if they would share their stories. I was unprepared for how deeply traumatic and desperate each of these stories began. My heart hurt horribly as I heard the way each of their lives had fallen apart because of addictions – it hurt worse to think of the pain that had driven them to drugs or alcohol in the first place. Addiction caused them to eventually lose everything that makes life worth living – the greatest loss being their family’s trust and confidence, losing their families all together, and of course losing their businesses and any successes of any kind that they had once had. And then they began to tell the joyful ending of those stories, the part that had happened this past year as they began to meet with the sister missionaries and learn more about God and His Son, Jesus Christ, and be affected by the witness of the Holy Ghost. They began to find hope in ways they never had before. In each of their stories, it was easy to see, looking back, the hand of God, leading them along and watching over them. They shared the changes that began to happen in their lives and souls, and then the changes that began to happen around them. They even began to see their families return to them and the father who had led all of this had his son sitting beside him as he spoke to us this evening. 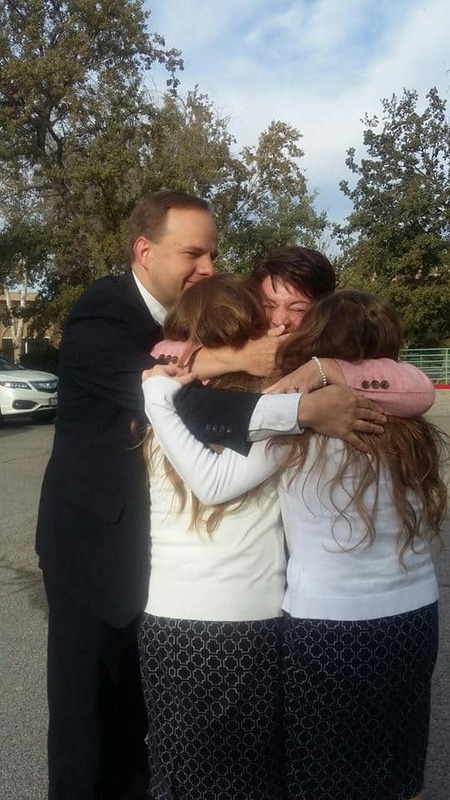 A couple of the many miracles we saw as we went with Sister Hoffman and Sister Hoffman: Anna had taught a mother and her children the Gospel of Jesus Christ in one of her first areas. The mother was baptized and joined The Church but the children could not be at that time, waiting for permission from their absent father. The day we headed to Portland there was an ice storm and flights were canceled. The girls and I thought we could just get a plane the next morning but my husband felt an urgency to get there that night, so much so that he finally booked a flight to an airport 3 hours from Portland and drove us the rest the way. As we boarded this evening flight Anna got a hold of this mother she had taught by text and asked if we could visit the next morning. She responded telling Anna she couldn’t come into Portland because she had moved an hour away and the children were getting baptized that morning!! We were THERE!!!! Anna was able to see the rest of the family baptized that beautiful morning!!! Anna had prayerfully considered which ward to visit that last Sunday we were there. 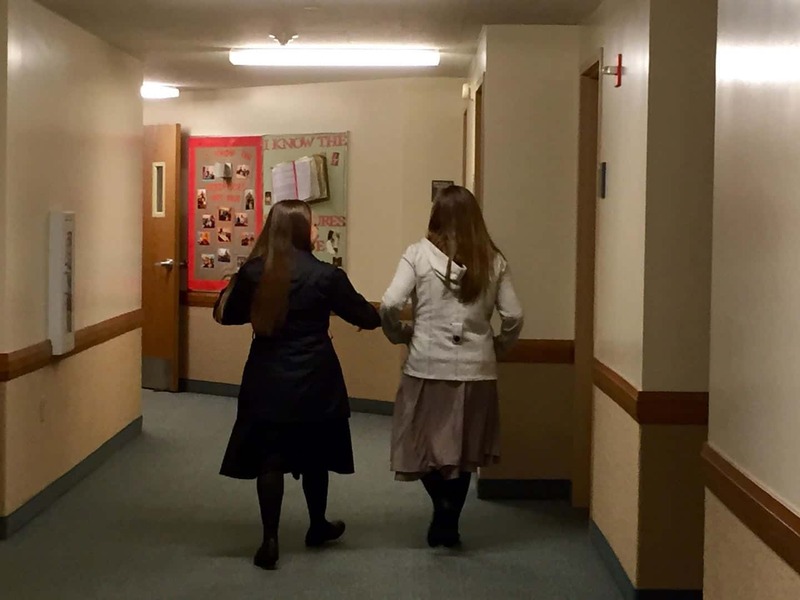 She decided and we attended only to find that the young man she had taught nearly a year ago who had been baptized and joined The Church was speaking that morning, his last day in that ward before moving for more education. What a blessing for Anna and for us to hear his testimony and to see with our own eyes the light and joy in him and the blessing the Gospel of Jesus Christ had been to him!!! We left that week of visiting with Emily and Anna and some of those they had taught on their missions with our hearts full to the brim with JOY and PEACE and LOVE and with a husband’s determination to keep more fully the commandments of God and turn our lives and focus more fully on Him as had these wonderful people we had met who had literally and temporally, as well as spiritually, experienced His redeeming love!